Depart on your scheduled flight to Munich today. On arrival we'll transfer you to your hotel in St Georgen, a picturesque resort in the heart of the Austrian Lake District and close to Lake Attersee. You'll have plenty of time to explore this enchanting village at your own pace but first you're invited to a welcome drink before dinner this evening. You're free to explore St Georgen at leisure today. If you're an art-lover you will be interested to know that Symbolist painter Gustav Klimt spent many summers in the region, which inspired a vast majority of his landscapes. We'll take you to another lakeside resort today on an included visit to St Wolfgang. This is home to the legendary White Horse Inn, which was made famous by the musical comedy of the same name. Sat on the north shore of the Wolfgangsee and at the foot of Schafberg Mountain, this charming market town is a lovely place to enjoy a stroll. As you go, you'll find narrow, cobbled streets lined with tall, ancient buildings, and make sure you visit the church – it boasts a spectacular carved Gothic altar.the church here – it boasts a spectacular Gothic altar. Alternatively, why not join our optional excursion to a Austrian Brewery including a tasting, of course. Round off your holiday today with an included excursion to 'The Sound of Music' city Salzburg, one of Europe's best preserved historic cities. On your guided tour you'll learn that its old centre has hardly changed since the times of famous Austrian composer Mozart. Discover Baroque domed churches, merchant houses and hidden arcaded courtyards dominated by the Hohensalzburg Fortress. 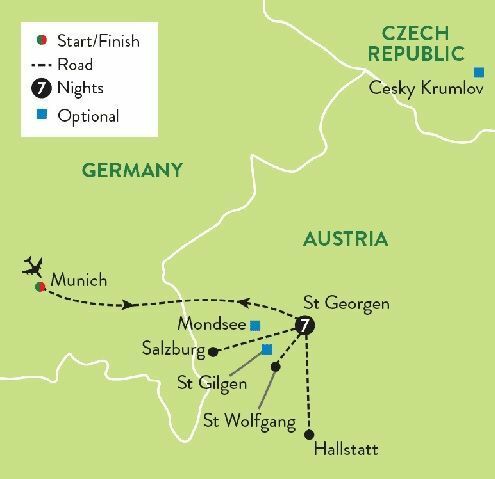 Prepare for a scenery overload as you journey through some of Europe’s most spectacular scenery on this enchanting 8-day tour through the Austrian Lake District. Enjoy a folklore evening, a relaxing cruise and a tour of Salzburg with coffee and cake. The Hotel Attergauhof, St Georgen is family run and is owned by the Söllinger family since 1966. The hotel has expanded and modernized throughout the years and is now a traditional 3 star hotel, centrally located in the charming village of St Georgen in Attergauf. The Attergauf is perfect as a base for exploring the region located close to Lake Attersee, surrounded by mountains, hiking trails and of course, the wonderful city of Salzburg. Hotel facilities include the lounge restaurant serving traditional home cooking and local dishes such as homemade apple strudel and Salzburg dumplings, not to forget their attentiveness to sourcing seasonal ingredients. The drinks lounge serves finger food, cocktails, local beers and regional wines. If the sun is shining, the garden terrace is available for a drink or an ice cream sundae. With 30 rooms, each are equipped with private facilities including: en suite facilities, telephone, radio, satellite TV and Wi-Fi.